Attending Disney’s the Nutcracker and the Four Realms Red Carpet experience gave me memories that will last a lifetime! I was hosted by Disney for the #DisneysNutcrackerEvent but all opinions are my own. This week, not only did I get to attend the red carpet world premiere of Disney’s the Nutcracker and the Four Realms, I got to see one of my most anticipated movies of the year for me. I won’t post any spoilers in this post because I want you to go see it and experience it the way I did with no preconceived notions. Below is my Disney’s Nutcracker and the Four Realms Movie Review. I will say that Christmas came early this year for my girls because Disney’s the Nutcracker and the Four Realms hits theaters today! Let me start by saying that as a long time Nutcracker ballet aficionado, my expectations were high. I knew it would be different because one is a movie and one is a ballet. In a movie, you obviously have the luxury of using your words and in ballet, you only have your body as your means of expression. I didn’t know if Disney’s the Nutcracker and the Four Realms was going to be based on the ballet or the book. But I was excited to find out. I can now tell you that Disney’s Nutcracker is not based on the ballet, though there are elements of the ballet peppered within. It is based on E.T.A. Hoffmann’s tale The Nutcracker and the Mouse King. Disney’s Nutcracker and the Four Realms Movie is rated PG and aside from a few Nutcracker Battle scenes it is very light. Safe for most children, in my mom opinion. Unlike the ballet that only has three realms, the move has four realms. The land of sweets, the land of snow, the land of flowers and a mystery land but you’ll have to go see the movie to see what the mystery is. All the lands are different and beautiful in their own way. The Nutcracker would not be the Nutcracker for most without some ballet so fear not because not only did Disney bring the ballet they brought the best, Misty Copeland. If you’ve never seen Misty Copeland dance the Nutcracker, this is a definite bonus of seeing Disney’s the Nutcracker and the Four Realms. Ms. Copeland’s dancing inspires and delights. If you are a fan of the ballet, the scenery will not disappoint. One of my favorite things about seeing the production in the theater is the transformation of a stage into the land of sweets. Disney’s the Nutcracker and the Four Realms does not disappoint. The scenery is absolutely breathtaking and transformative, transporting you through time and space. 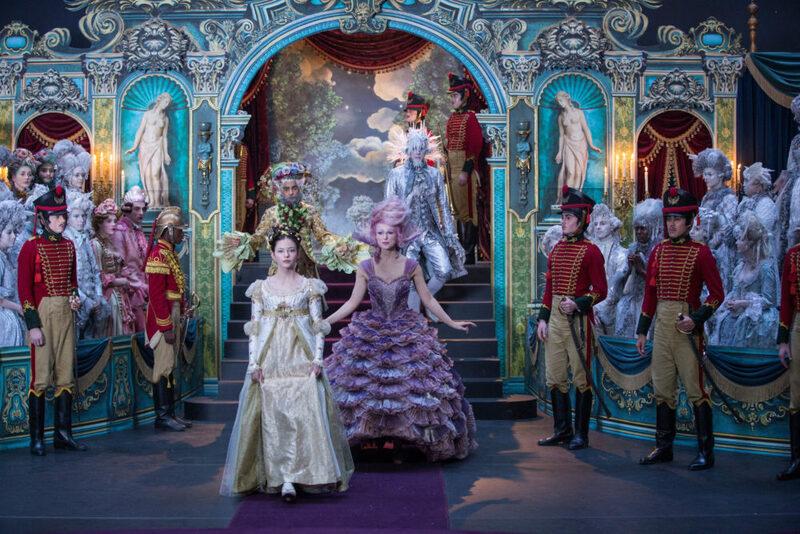 Crisp white snow falling against the colorful backdrops in the Nutcracker movie is cinematically breathtaking. The costumes were beautiful and vibrant, each one a perfect reflection of the character wearing it. If you are familiar with the Nutcracker ballet you will see a lot of familiar costumes which will leave you with that warm fuzzy feeling of nostalgia that we all associate with the Nutcracker. Keira Knightley with her cotton candy hair, baby voice and bubbly personality gave me a whole new perspective of who the Sugar Plum Fairy really is. She will make you laugh but don’t be fooled, she is definitely more than just a pretty face. After seeing the movie, I can tell you this, expect the unexpected. Expect for your eyes to be dazzled by the beautiful imagery, your heart to swell with a new twist on a classic tale and your ears to find familiarity even amongst the exciting twists and turns that only Disney magic can provide. 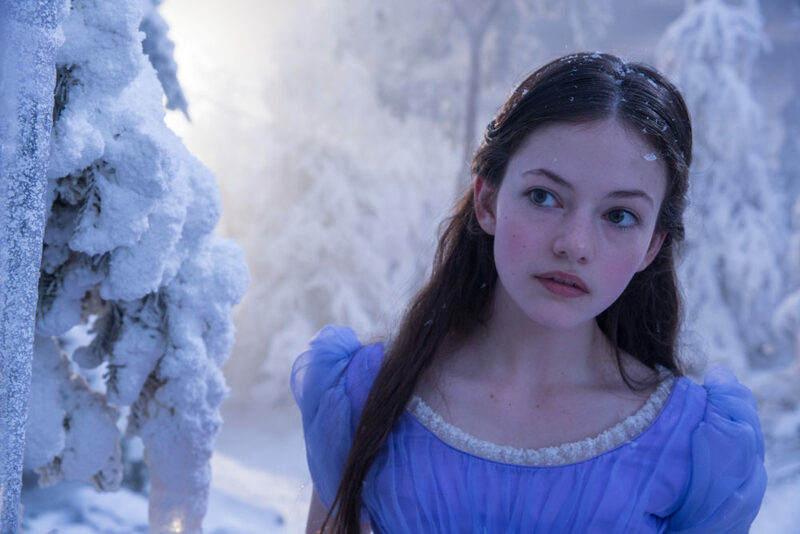 Mackenzie Foy, to me, is the perfect Clara. A Clara for a new generation of girls to look up to. Not only is she what we’ve all imagined Clara to look like our entire lives, but she is also simultaneously a plot twist; an enigma wrapped up in a mystery. She may at first glance appear delicate but she is strong, self-assured, confident, smart and not afraid to face her fears. Not afraid to be the change, not afraid to say no and find her own way. She embodies everything we hope our little girls see in themselves and I think by seeing Mackenzie in such a strong, inspirational role they will. Without giving away the ending for you, especially if you are a fan of the ballet, I really want you to watch Disney’s the Nutcracker with fresh eyes and an open mind. Pretend it is the first time you’ve ever seen the Nutcracker and enjoy every single moment. While it definitely pays homage to the classic, it stands alone as a new classic. You will want to watch this over and over again. It’s the movie you will watch with your children and your children’s children. It’s heartwarming in all the best ways and recognizable enough to pull at your heartstrings with nostalgia. Just remember, and this is all I am saying, there is a plot twist from what you’ve known of the ballet and it’s more than just Mother Ginger. So go see it for yourself and expect the unexpected and them let me know what you think of Disney’s the Nutcracker and the Four Realms. I just saw it but you can believe that tonight, I’ll be seeing it with my girls. They’ve been texting me and begging me to tell them all about it since I saw it but I want them to experience the magic of Disney’s the Nutcracker and the Four Realms all for themselves and I can’t wait to be there to see their reactions. If you see it or take your children, I’d love to hear your reactions and what your children thought. Please leave them in the comments section. And if you see it, what was your favorite part? Why? If your kids love the movie, as much as I think mine will, these Disneys the Nutcracker and the Four Realms Coloring sheets are loads of fun to color.